Key lime pie is one of my favorites, so with spring finally here I thought some key lime would be tasty! …but I decided to do cake this time. By the way-this is a very moist cake. It can also be baked in a 9-by-12-by-2-inch pan to be easily served in squares. Also, I use whatever limes I can find…regular limes seem to work great! Preheat the oven to 350 degrees F. Grease and flour 3 9-inch round cake pans. In a large mixing bowl, mix the gelatin, sugar, flour, salt, baking powder, and baking soda. Stir to mix well. Add the eggs, oil, orange juice, lemon juice, and vanilla. Divide the batter evenly among the 3 pans and bake for 35 to 40 minutes. Test for doneness by lightly touching the tops of the layers or inserting a toothpick. Cool the layers in the pans for 5 minutes, then turn them out onto racks. 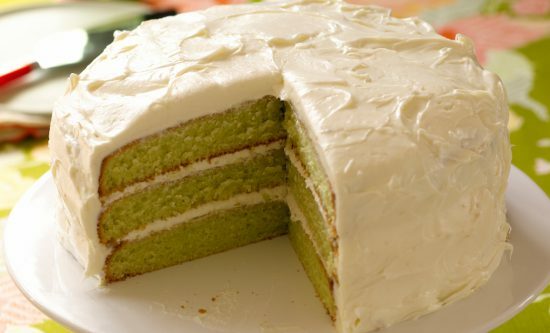 While the layers are still hot, mix the lime juice and confectioners’ sugar and pour it over the layers on the racks. You can pierce the layers with a fork to allow the glaze to soak in better. Allow the layers to cool completely as you prepare the icing. Cream the butter and cream cheese. Beat in the confectioners’ sugar until the mixture is smooth and easy to spread. Spread the icing between the layers and on the top and sides of the cake. *The cream cheese icing is optional. This cake is beautiful and tastes great with just the glaze poured over it.